Review Center is a Consumer product reviews website where you’ll find reviews by those who actually used that product. We are focused to provide you with latest and detailed review of every product we went through. Currently it’s a new start up and is growing at a very fast pace. And we invite all groups of people to write reviews for us, so that they could show their great writing skills and dedicate good content to all those persons who actually need to read reviews before purchasing any product. You’re welcome to write on any consumer product you used. If you observe a little deep, you use so many products in your whole day deeds, and you never realized that you could write a review on it. And if you are still skeptical, then you can check our menu to choose topics from to write a review. Whenever you write a review for us, you get a back links for your website from us. And more backlinks means more advertising rates. It gives more exposure to your blog from search engine and you get free visitors from us too. We even offer a personal Author page too along with Author Box of yours where information “About You” and your blog is listed. And all reviews wrote by you would be listed below it. See below screenshot for reference and live example. It has been proven many times, that if any search result appears with rich snippet like Star Ratings or Author Pic or Video Pic, people definitely comes to see that result and hence more visitors for your review and hence more earnings for you. So in short, your review is at a good place!! You get full credit of authorship of your review to you only. You can check anytime by going to Google Rich Snippet Tool to check who write a particular review on our website or you can check on article itself, that only your name will appear with your review. You can see an example screenshot for reference. First of all, we would like to clear that we are NO way affiliated to Google for claiming Google Authorship. It’s just a matter of luck and time. 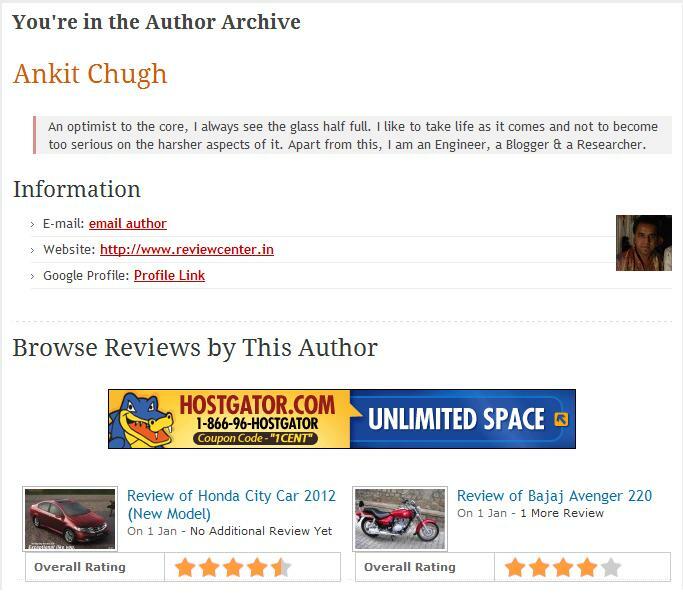 Since you would have a personalized page of yours and will have listed all your review in it, you can use this page to apply for Google Authorship and if your luck is Good and Google finds that reviews of yours are quiet enough good to match that quality for Authorship, you can even find a Pic of yours coming in search results along with your review. This brings more and more fame to you. We have ensured while designing this website, that you may not get any error while proving authorship of your article to yours. 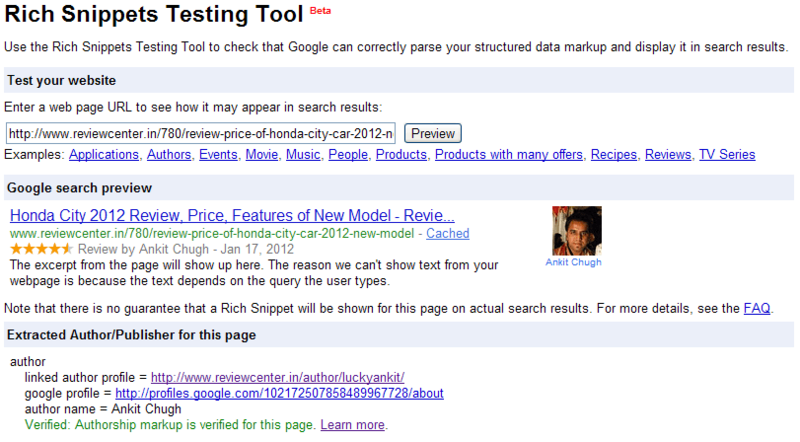 Update: 2 Authors have successfully got Google Authorship by writing on Review Center. Luck by chance, currently only 2 authors have written articles here. We offer a premium adspace for our reviewers. 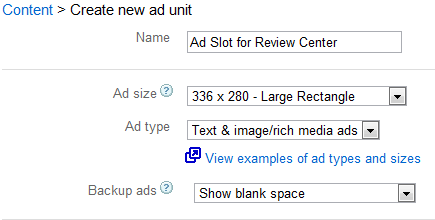 We offer a 336*280 ad space of Adsense Ad on left side Star Ratings on your review. You are given an option of entering ad slot no. with publisher id, so that only your advertisement may appear on your review. And you will earn 100% revenue from the advertisement being displayed on your review. See following screenshot for reference. Just in case, if you don’t have an Adsense account, then you can contact any friend/relative of yours to create a custom channel on your name in his/her adsense account, and you can generate advertisement code with that custom channel, so that any revenue made using that advertisement code will appear in custom channel of yours only and you find out anytime how much revenue you made in any particular day or week or month. To encourage more and more authors to write only honest product reviews here, now we are offering Price per Article to eligible authors. So, we are here listing below price of articles as per category. But before that, there is one thing which should be clear that product which is being reviewed must be a running model in market. Like in case of cellphones, the product gets outdated in few months. Same case is applicable for Televisions too which get outdated in years. So, before writing any review, please drop us an email stating the product model and some more details related to it. Please do not start writing any review before getting confirmation for it. Also there is one more condition. If you’re getting paid from us for reviews, you’ll not be allowed to insert your own advertisements in your reviews then. A review once published, is a part of Review Center then. So, either you can choose to get paid for articles or you can insert your advertisement in it. Please Note: There is a threshold limit that you can claim your payment only after you get 5 reviews of yours published here. This is done to avoid very frequent payments. 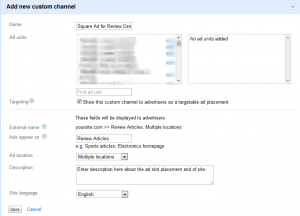 For knowing how to create a custom channel in adsense account – read here. Note: For preventing spam, an author is allowed either to use backlink benefits or advertisement slot. That means if your review or your author bio contains backlink to your site, then you’ll not be allowed to use advertisement slot. And if you want to use advertisement slot, then the only place from where you’ll get backlink to your site is your own author page. We really hope to create an interest inside you now to write a review for us. If you want to get started for writing reviews here, read this – Basic guidelines for writing a review. Do Contact Us for any query if you have in your mind. Enter Any name you like (e.g. 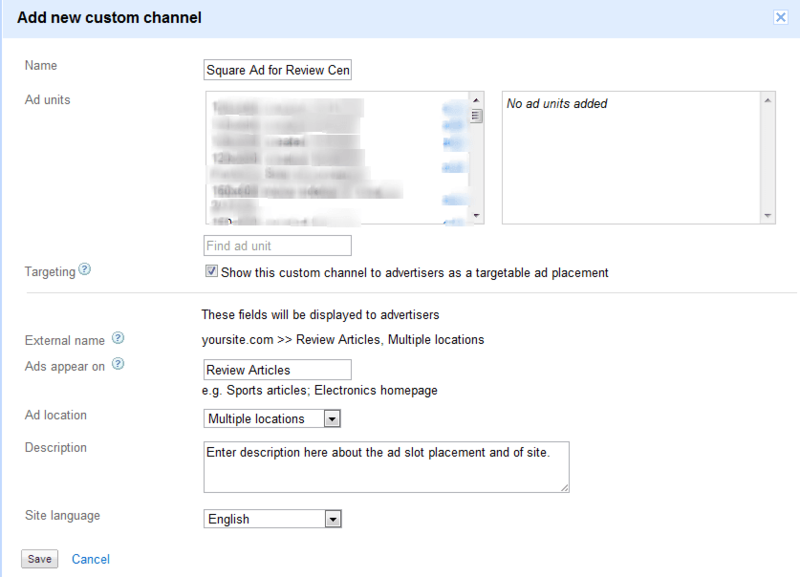 – Square Ad Slot review center) This channel name will appear in your daily adsense reports. Now login to Review Center and go to this url. Enter details as required as you got by following instructions given above. And enter your contact no. (its optional) which we’ll keep just for records and feedback to ask how there reviews and ad units are performing. Make sure that you enter Advertising id with “pub-“. Hit “Save Changes” and now your ad will appear on your review no matter whenever you write it so.